Christmas Ornaments Made in USA - Lime Green Crystal Glass Optic Three Inch Ornament Ball - A Christmas Ornament Co. 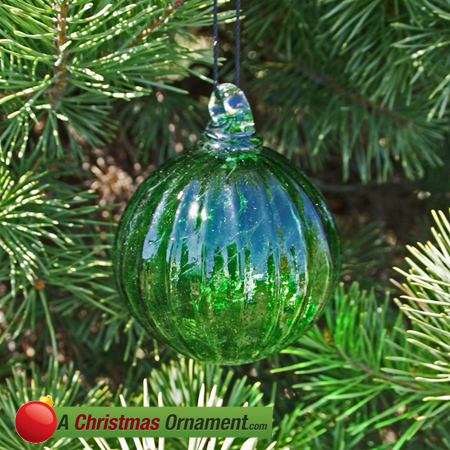 Here is a great example of American Craftsmanship: a lime-green, hand-blown (using the soda-lime glass-making process), Christmas ornament is made by a glass blowing company that have been in the business for 80 years. This "optic" ornament was hand-blown into a very old Victorian-style antique mold acquired by craftsmen from a long defunct glass-blowing operation in Ohio. Since each one is hand-made (although with a mold, not "free-blown") no two are exactly the same. This Christmas ornament is not only incredibly beautiful, but also incredibly durable, rigid, and scratch resistant. Made in the U.S.A. by seasoned artisans. Ornament is 3 inches across.